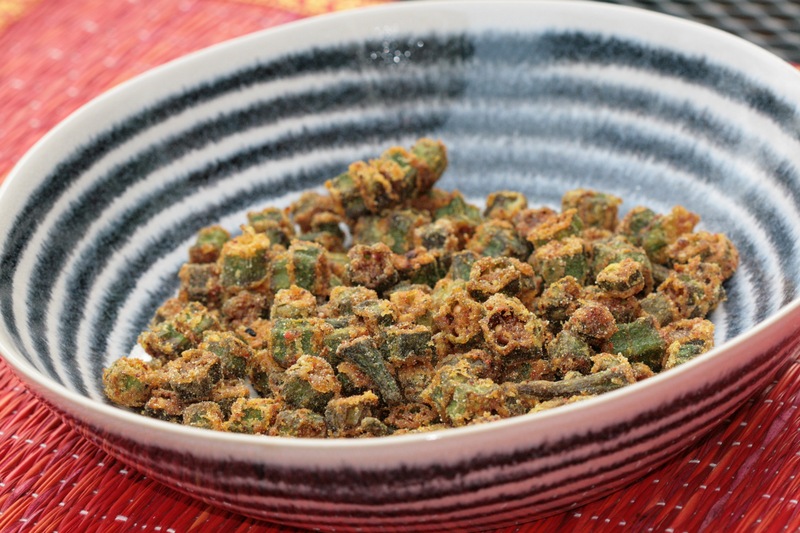 Spicy fried okra is quite a common side dish in the Pathare Prabhu household. Well, at least in our branch of the family it’s a favourite on the days when there’s no fish to be had and papads are just not good enough. It goes well with any meal and the spicy, crispy avataar of the okra can breathe some excitement into the simplest of meals (which, back home, usually meant vegetarian meals). As with most of my recipes, you can turn up the heat or tame it down to suit your palate. It’s crisp without being fried within an inch of its life and spiced enough that you can still the fresh taste of the okra inside. Wash and drain the okra. Cut into 1 cm wide pieces and keep aside. Sprinkle the dry spices and salt till the okra pieces are well coated. In a wok, heat the oil. To test if the oil is hot enough, put in a pinch of the rice flour. If it turns foamy, the oil is ready for the okra to go in. Dredge the okra in the rice flour and fry till they are crispy. Best eaten piping hot. The okra turn limp and soggy when they turn cold. Don’t even think of re-heating them. Sambhar Powder is a specialty of the Pathare Prabhu community. You could use coriander-cumin powder in its place, although it will alter the taste. This entry was posted in Accompaniments and tagged bhende, bhindi, epicurious, fried bhende, fried bhindi, fried okra, okra. Bookmark the permalink.